Old map by ANTIPHONARIUM. - Leaf on vellum from a antiphonary. Title: Leaf on vellum from a antiphonary. Size: 19.3 x 14.2 inches. Condition: Boldly hand-written in a Gothic rotunda, text lines and music staves, on a large sheet of sturdy vellum. Signs of use, little wavy, but good. 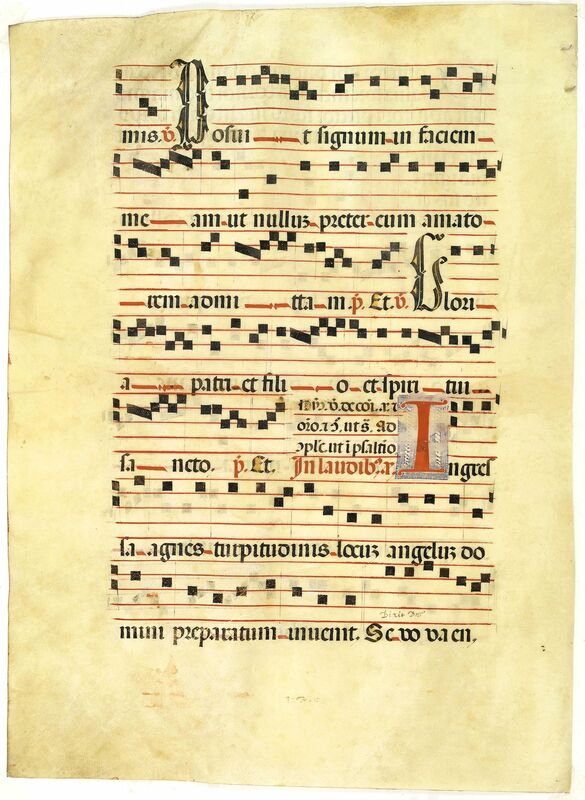 A leaf from a Medieval Antiphonal or Choir Missal for Spanish use, in Latin on extremely heavy vellum. 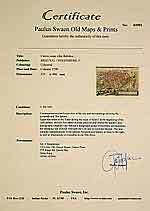 Justification: 360x246mm. Text is in Spanish rounded gothic hand (Rotunda) and of music on a stave formed of five lines in red. RECTO: There are seven lines of music and verse in black ink. With a large initials in red and an initial coloured in blue. VERSO: There are seven lines of music and verse in black ink. With a large initial coloured in red on a ground in filled with geometric and floral patterns coloured in royal purple. Two initials in black and yellow. Minor thumbing of frequent use on the left hand corner. The antiphonal is a liturgical book containing antiphons, or liturgical chants, with prose text. It is sung in association with a psalm at the services of the Divine Office.